Florida fans have been upset and disappointed by the lack of offense the team has played with. Social media shows many Gators fans questioning head coach Jim McElwain, and offensive coordinator Doug Nussmeier. Many fans have even called for one, or both to be fired. The coaching carousel hasn’t really gotten going, as only a few Power 5 openings have come available, and several of those spots have already been filled. USA Today reports that Oregon is leaning towards firing head coach Mark Helfrich after “laying the groundwork” for a coaching search. Well, Florida fans, if Wolken knows what he’s talking about, you may end up with a new coach like you hope. 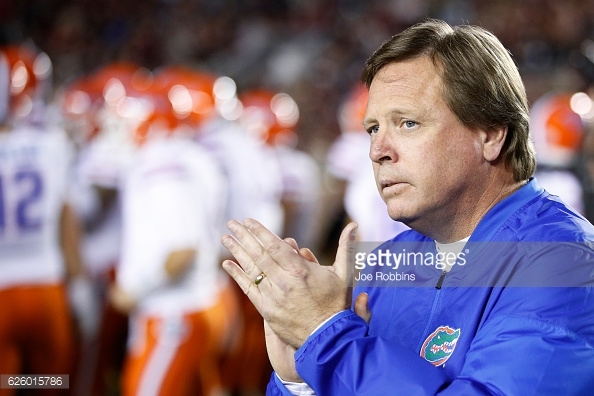 McElwain is 18-7 in his two seasons as Florida’s head coach. McElwain is also the first SEC coach to earn back-to-back trips to the SEC Championship Game in his first two years. Florida faces Alabama in Atlanta on Saturday. Stay posted with The Gator Chomp Blog for more updates as this story develops. If he is saying this to get a raise, him and his horrible players can LEAVE the SWAMP. If he doesn’t beat BAMA this weekend, he has no business being a coach at UF. Quite possibly the most stupid comment ever. Forget two SEC East titles in first two years in the face of nothing but disaster at quarterback and injuries. “If he doesn’t beat BAMA this weekend, he has no business being a coach at UF.” Derpity derp derp derp. When he wins or looses the only words that come out his mouth is that stupid sh-t …MAN THIS IS FUN .THIS IS WHY YOU COME HERE. No you come here to win for your team and your fans . Not because its exiting for you to actually play in a real venue……. Like the injuries are his fault. SMH. If that UNT player didn’t take out Del Rio, he was our quarterback for the year. We would be playing the Freshman quarterbacks if it was earlier in the year. “Yeah let Collins go, our defense suxx.” Derp derp derp derp. Coach Charlie Strong come on down. Recruiting would be insane!! FLORIDA will not get elite recruits again until they start winning and putting the right people in place. A good start will be when the new football complex is built and the new dorms are implemented. I think Chad Morris could take this talent over the top with his play calling ability, however the main problem is still at the QB position. That issue was resolved when Grier was on deck but that is no longer the case. Jim McElwain is way over his head…needs to be gone and take Nussmeir with him. Les Miles would love to come to Florida!